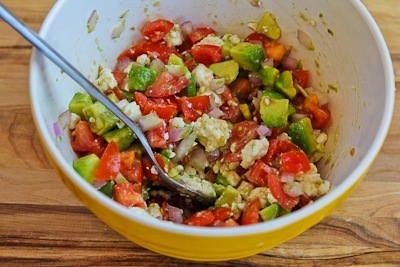 When fresh tomato seasons arrives, make Lisa’s Cross-Cultural Salsa with Tomato, Avocado, Lime, and Feta to serve over chicken, fish, or pork cooked on the grill! And this tasty salsa is low-carb, gluten-free, meatless, and South Beach Diet friendly! Click here to PIN this tasty recipe so you can make it later! Lisa is the one who shared her “dumb” salad recipe that I renamed Not-so-Dumb Salad with Cucumbers, Tomatoes, Onions, Avocado, and Balsamic Vinegar. That recipe has been wildly popular on the blog and I promise you that Lisa’s Cross-Cultural Salsa is just as good. I ate it over grilled fish when I tested the recipe, but I’d love this over sauteed or grilled chicken breasts or pork chops, or as a topping for tacos or burritos. And of course if it’s a hot summer night and you’re sitting out on the deck, you could certainly eat it with toasted pita bread or chips! 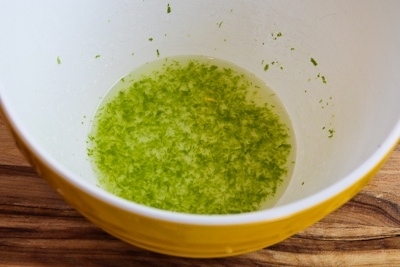 Start by zesting a lime and squeezing the juice into a bowl that’s big enough to hold all the salad ingredients. Cut up the avocado and toss with the lime juice and zest. 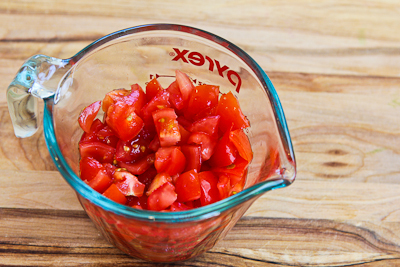 Chop enough tomatoes to make 1 cup chopped ripe tomato. 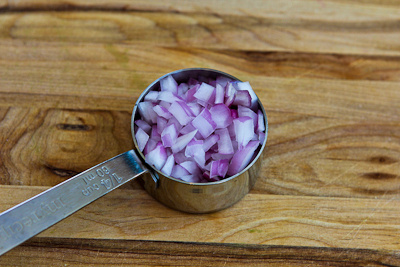 Chop 1/4 cup red onion (or you could use sliced green onions. Crumble 1/2 cup Feta cheese (or less, I think 1/3 cup would have been fine. 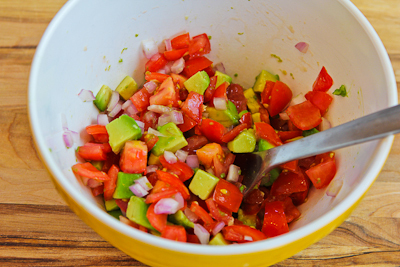 Mix together the lime juice, avocado, tomato, and red onion and stir to combine. Then gently stir in the crumbled feta until it’s mixed into the salsa. Season with salt and fresh ground black pepper to taste and serve. Zest the lime and then squeeze the juice, putting zest and juice into a bowl that’s big enough to hold all the salsa ingredients. 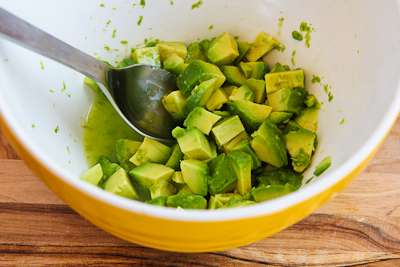 Dice the avocado into the bowl and toss with the lime juice and zest. Cut up enough tomatoes to make 1 cup diced fresh tomatoes. Finely dice the red onion and crumble the Feta. Stir tomatoes and red onion into the avocados and lime juice and mix until well-combined. Then gently stir in the crumbled Feta just until it’s mixed into the salsa. (Don’t stir too much.) Season to taste with salt and fresh ground black pepper and serve. Serve the salsa over grilled or roasted fish, grilled or sauteed chicken, grilled or sauteed pork chops, or steak. It could also be served as a topping for tacos or part of the filling for burritos, or simply as a salsa to be scooped up with chips or toasted pita chips. This salsa is loaded with low-glycemic and low-carb ingredients, and as long as you don’t overdo it on the Feta, it would be approved for any phase of the South Beach Diet. It’s also great for most other low-carb diet plans. There are so many great flavours packed into this salsa! My cherry tomatoes just started coming in a few days ago – this sounds perfect for some of them. My tomatoes just got planted…I think I'll have to buy some and try this tasty sounding salsa. Hmm, interesting combination! I wouldn't have thought to use feta with a salsa–but I bet the saltiness works exceptionally well with fresh tomates & avocado. Looks delish! I would just eat with a spoon! I love this combination and the colors are just brilliant – this would make a nice summer appetizer served on crostini. Thank you for sharing Lisa and Kalyn! Here in North Florida the tomatoes are coming in faster than I can pick them, this will be a great way to use some!! I wouldn't even need a vehicle for this salsa…just a spoon. Sounds delicious! Debby, it was great even with these tomatoes from Costco, but I can't wait to make it with red and yellow tomatoes from the garden! This sounds so tasty. Thank you, I will try it when my tomatoes come in. Lydia, I knew you would like it and NO cilantro! 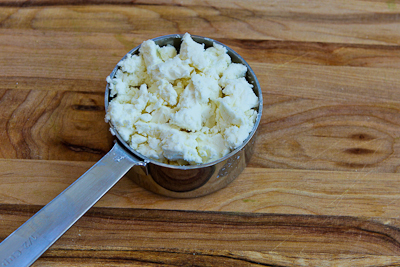 Oh, feta! What an inspiration! Thanks, Lisa, and thanks, Kalyn, for sharing this recipe. Can't wait until my garden tomatoes come in.